What a wonderful Friday & Saturday I had with the Indiana Farm Bureau members! I had the privilege of speaking to the group on Friday night to tell them about Bucket Buddies and then to a speak to a smaller group on Saturday in a breakout session about goals and making dreams come true. It was one of my favorite talks I’ve ever done – Follow The Yellow Brick Road To Your Field of Dreams based on Dorothy’s journey in the Wizard of Oz and how she met the scarecrow, lion and tin man. I equated that to our journey through life trying to reach our goals and along the way we may not have courage or we may lose heart or we may think we don’t have the brain to accomplish something. But in reality we have the power all along in our “little red shoes”. Thank you to Ashley Beasley, Women’s Leadership Program Director, and the Women’s Leadership Team for giving me this opportunity. 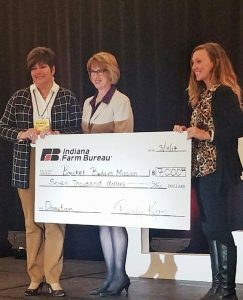 Also a HUGE THANK YOU TO THE INDIANA FARM BUREAU for donating money from the live and silent auctions to Bucket Buddies Mission!! Their GENEROUS donations totaled $7,000!! Yes….$7,000!!! That will fill over 1,000 buckets. This will make a difference to over 1,000 children who suffer from cancer and other life-threatening illnesses. I am overwhelmed, excited, thankful and humbled that you chose Bucket Buddies to support!! I thank every single person who contributed to this cause. You all are absolutely wonderful!! This entry was posted in Uncategorized on March 13, 2017 by Deanna Young.